A NATURAL SHIELD: Moringa leaves help prevent various diseases in human beings. Some time ago in a remote village of eastern India, Balbir S. Mathur, a naturalist who heads a United States-based organisation called Trees for Life, came across a traditional medicine practitioner who made an outrageous claim saying that the “leaves of the Moringa tree prevent 300 diseases”. His claim was based on real life experience. Now science is confirming it. The more we study, the more it seems that the Moringa oleifera tree truly delivers wonders, said Mr. Mathur in his note circulated at the launch of the “Ankur-Save the Sight” project on prevention of blindness programme in children at KLE Prabhakar Kore Hospital in Belgaum on Monday. Trees for Life has been working to create awareness, train people to plant and take care of trees. It is providing them with the resources needed to accomplish their tasks in different parts of the world, including the U.S. and India, for more than two decades now. Moringa leaves or drumstick (known as Nugge kayi in Kannada and Munaga in Hindi) leaves contain vitamin A, which acts as a shield against diseases of the eyes, skin and heart, diarrhoea, and many other ailments. Carrots are high in vitamin A, but moringa leaves are even higher, he said. Importantly, his claims on nutritional value of moringa leaves are based mostly on the analysis done at the National Institute of Nutrition in Hyderabad and the information on dried moringa from an analysis sponsored by the Church World Service and the Department of Engineering at the University of Leicester and performed by Campden & Chorleywood Food Research Association in Gloucestershire, United Kingdom. According to Mr. Mathur, Moringa leaves are one of the richest sources of essential nutrients often lacking in people’s diets. They even contain all of the essential amino acids, which is unusual for a plant source. Experts agree that the long-term solution to malnutrition is the use of foods rich in the essential nutrients often lacking in people’s diets. 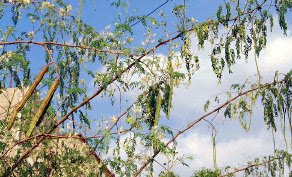 Modern scientific research is proving that Moringa leaves are one of the richest sources of such nutrients. Moringa leaves provide two times the protein of yogurt, seven times the vitamin C in oranges, three times the potassium in bananas, four times the vitamin A in carrots and four times the calcium in milk, he said and added that the figures reflect gram-for-gram comparisons with Moringa leaves. Meanwhile, Cdr. (retd.) Kailash Girwalkar, Director, Blindness Prevention Project, Somaiya Trust, Mumbai, and M.V. Jali, Medical Director and Chief Executive Officer of KLES Prabhakar Kore Hospital, pointed out that though Moringa tree fruit or drumsticks are used in almost every kitchen, it was mainly for its taste. Many are not aware of such rich nutrient value in the leaves of this tree. Using these leaves in the daily diet will shield against long-term blindness and other diseases. It is a must for the children as it an very important role in preventing visual impairment or early loss of vision.